sailboat. : Currently Coveting: Pandora Bracelets. For the longest time I was not a fan of Pandora bracelets, instead I always favoured the more traditional charm bracelets. I absolutely adore my charm bracelet but I hardly ever wear it because the charms manage to get caught on absolutely everything and I would hate to damage it! The concept of a charm bracelet is one that I will always think is wonderful, I see them as something to add to over time, getting a new charm to remember or symbolise a huge moment or event in your life and I am longing to start a bracelet that I would be able to wear everyday if I wanted without having to worry about if it's going to get caught in my favourite dress. I remember looking in to Pandora/Chamilia/Troll Beads bracelets years ago and felt a little underwhelmed with the charms they had; they seemed a little tacky & I don't know, just not me. As I was browsing the websites last weekend I found myself falling in love with a lot of the designs, so I think my tastes have changed in recent years. Either way, it's pretty safe to say that I'm lusting over these bracelets big time right now! I think I might treat myself the next time I'm near a Pandora store to a silver bracelet, it's a bit of an investment at £55 but from what I can tell I think they're worth it. But I'd love to know your opinions, if you have one & if so, do you wear it a lot and do you think they're worth the price? Sometimes I tend to get a bit carried away with jewellery pieces like these, I'd hate to invest lots of money on something if there was a better alternative! Do you love the concept of charm bracelets like I do? 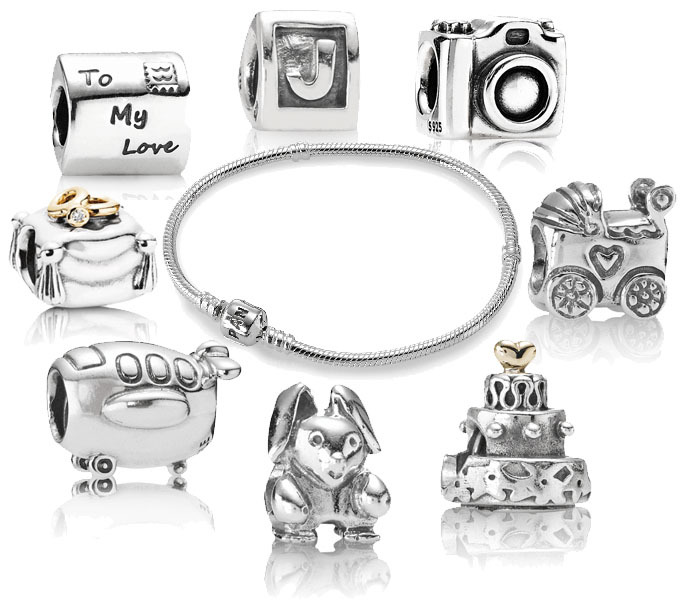 What do you think about Pandora bracelets? Do you have one of your own? I'd love to know if you wear it a lot if so! P.S. I just thought I'd mention that this is not a sponsored post in any way, shape or form. Nor was I asked by anyone to write any of this. I've seen some blog posts & also some close friends receive Pandora bracelets as gifts recently and they seem to have really sparked my interest! I have a pandora charm bracelet and I would not be with out it now. I wear it every day and the charms I have on there many some special to me and I don't have the problem with it getting catch on clothing. I think getting a charm bracelet like this is the way forward as you can wear it every day without worrying about it getting damaged. I've felt exactly the same way for a long time and only recently found myself completely swayed towards a Pandora bracelet. I could see myself falling in love with one right now. I do prefer normal charm bracelets, but I can see these being easier to wear not catching on things. I have the silver braclet and the double pink leather bracelet and i really love them both so much! They both look good no matter how many or few charms you have on them, and they look so simple and classic if you wear them alone without the charms. They're such a good way of accesorising as you can change it to match any outfit. I definitely recommend them if you are thinking about it! I have a double brown leather bracelet and the silver one. I wear the leather one all the time and love it to bits, it literally does not leave my wrist and contains all my lovely meaningful charms. On the other hand i hardly ever wear the silver version. It traps the little hairs on my arm all say and the pulling hairs out feels yuk. I would like to point out that i have neither chubby wrists nor hairy arms! just sayin! When Pandora crashed onto the scene I always thought it wasn't my thing. A bit too shiny and neat for me, I like old and worn and unusual things. However I received a Pandora bracelet as a gift and I probably hadn't really thought it through because I love the idea of charm bracelets! My nan and my mum had similar ones to each other that I used to be in awe of when I was a little girl. Recently I was taken to a Pandora shop to choose a gift and I was blown away by the sheer volume of charm designs available. I mean... I chose a pineapple!! I would never have thought they would have carried a pineapple design. So in the end I fell for Pandora, but I only wear my bracelet on special occasions. It always keeps beautifully and looks great and my only gripe with it is that when the charms roll around they nip the tiny hairs on my arm. Ouchie! I have a traditional charm bracelet which I got for my 21st birthday (few years ago) and I hate how little I wear it as I'm scared of losing it. Pandora bracelets seem much more wearable in comparison. i really like the charms - they feel whimsical. i think investing in a pandora bracelet is a great idea - i don't have one personally, but everyone i know who does have one, loves it.